WE remember some of the moments from this week in Auckland City FC’s history. Another OFC Champions League cliffhanger is set-up after Amicale defeat Auckland City FC 1-0 in Lautoka thanks to a tidy goal by the dangerous Kensi Tangis. The defeat leaves Auckland City FC's future in the competition dangling by a thread as they finish in third place in their group. Auckland City FC's only hope of qualifying for the semi-finals relies on AS Pirae beating Waitakere United. 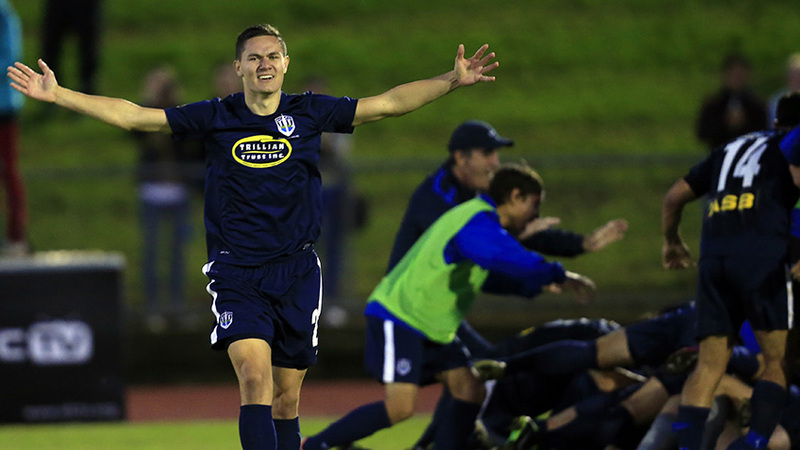 A win for Waitakere United would knock the Navy Blues out of the competition. AS Pirae - who defeated Auckland City FC 1-0 in the OFC Club Championship 2005 - can lose the match and still qualify in first place. Once more, Auckland City FC are powerless to control their own destiny. What takes place is etched in OFC Champions League history - Raimana LiFung Kuee scores within seconds of kick-off and the veteran Naea Bennett doubles the advantage 15 minutes later to leave Waitakere United sinking. Joel Stevens hands the Paul Temple-coached side a lifeline when he scores on the hour mark but Waitakere United are eliminated - and Auckland City FC rescued - when Jimmy Tepa confirms the 3-1 win with a goal in additional time. Auckland City FC go on to retain their OFC Champions League yet again after defeating Amicale 3-2 on aggregate in the final. A 1-1 draw in Port Vila with goals for Dominique Fred and Emiliano Tade set up a mouthwatering second leg at Kiwitea Street. Kensi Tangis opens the scoring in Auckland to put Amicale in the driving seat. The Vanuatu side's hopes of a first title and qualification for the FIFA Club World Cup hit a high when they're awarded a penalty only for Colin Marshall to see his spot-kick saved by Tamati Williams. Ryan De Vries levels the match midway through the second half and Tade sends Kiwitea Street into raptures with a brilliant last gasp winner. Auckland City FC dispatch Western United 3-0 in Suva, Fiji, as Darren White nets a double with another strike by Gustavo Souto in his second spell at Kiwitea Street. Auckland City FC pick up 3-0 wins over Suva and Amicale before knocking over FC Gaitcha 1-0 in a bad tempered semi-final where Marko Dordevic's goal proves the difference. Auckland City FC win an equally tempestuous OFC Champions League Final in a penalty shoot-out with Team Wellington after the pair were level after extra time. In 2011, the Navy Blues NZFC title hopes suffer a huge setback after they lose 1-0 to Team Wellington in the semi-final first leg at Newtown Park in the nation's capital. Ramon Tribulietx's side lose an early goal to former Navy Blues player Johnny Raj from which they never recover despite dominating the match and hitting the woodwork twice through Manel Exposito. In the week following this defeat, the Navy Blues are brushed aside 3-1 in the return match at Kiwitea Street to go out of the playoffs 4-2 on aggregate. Team Wellington lose the grand final to Waitakere United in a 4-1 rout. In 2007, skipper Neil Sykes scored the winner in a title-winning 3-2 win for Auckland City FC over Waitakere United in the New Zealand Football Championship grand final at North Harbour Stadium in Albany. Also on target for the Navy Blues are Liam Mulrooney and former All Whites striker Paul Urlovic. Their goals cancelled out strikes from Commins Menapi and Jeff Campbell. Waitakere United had won the minor premiership race heading off YoungHeart Manawatu by two points. The Navy Blues became the first and so far only club to win the New Zealand National League title despite finishing the regular season in third place. Victory for Auckland City FC confirmed their third consecutive New Zealand National League title. In 2011, Auckland City FC took on Amicale at Kiwitea Street in the OFC Champions League Final second leg, hammering their opponents 4-0 at Kiwitea Street to take out the title 6-1 on aggregate after a 2-1 win in Port Vila a fortnight before. Manel Exposito and Luis Corrales were on target in Vanuatu, cancelling out a strike from Fenedy Masauvakolo. There was only one team in the running after Alex Feneridis netted the opener in the return match with further goals from Daniel Koprivcic, Exposito and Adam McGeorge sealing the club's third Oceanic title. Auckland City FC's OFC Champions League title defence is thrown into disarray after a shock 3-1 home defeat to AS Dragon in the pouring rain at Trusts Arena in West Auckland. Adam Dickinson gives the Navy Blues the ideal start when he pots a first half penalty but the tide turns suddenly and late in favour of the Tahitians with three goals inside the final 15 minutes for the visitors. Teonui Tehau equalises on 76 minutes before skipper Ivan Vicelich puts the ball in his own net with six minutes left to play to hand AS Dragon the lead. Sylvain Graglia puts the icing on the cake for the visitors when he adds a third deep into additional time. The victory puts AS Dragon within touching distance of the semi-finals and they need to beat arch-rivals but also group whipping boys AS Mont Dore to knock the Navy Blues out. Auckland City FC had earlier beaten AS Mont Dore 12-2 and 2-0 so hopes aren't high for the champions. But the unthinkable happens - Dan Vakie equalises for AS Mont Dore late on to cancel Nicolas Vallar's opener for AS Dragon and the match ends 1-1. Another 1-1 draw in the return match between AS Dragon and Auckland City FC allows the Navy Blues to qualify at their expense and they go on to retain the title with a 2-1 victory over Waitakere United in the final at Mount Smart Stadium on 19 May 2013.